Yogananda had first arrived in America in 1920 at the age of 27. He traveled from India as his native country’s delegate to an international congress of religious leaders convening in Boston. 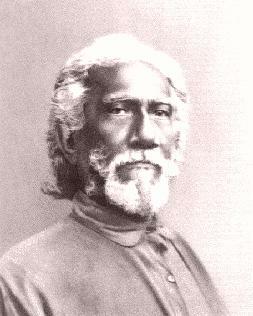 Over the next three decades, he traversed the country preaching the benefits of meditation and Kriya Yoga, a sacred technique of meditation which stills the body and the mind, serving to withdraw the energy from the turbulence of one’s thoughts, emotions and sensory perceptions so that it is possible to go within and commune with God), authoring volumes of spiritual texts, and founding the organization that would oversee his spiritual legacy and teachings, Self-Realization Fellowship (SRF), headquartered in Los Angeles. Yogananda captured the imaginations of both ordinary citizens and dignitaries, including Minnesota Governor Theodore Christianson, St. Paul Mayor Laurence Hodgson, and Thomas Walker, founder of the Walker Art Galleries. 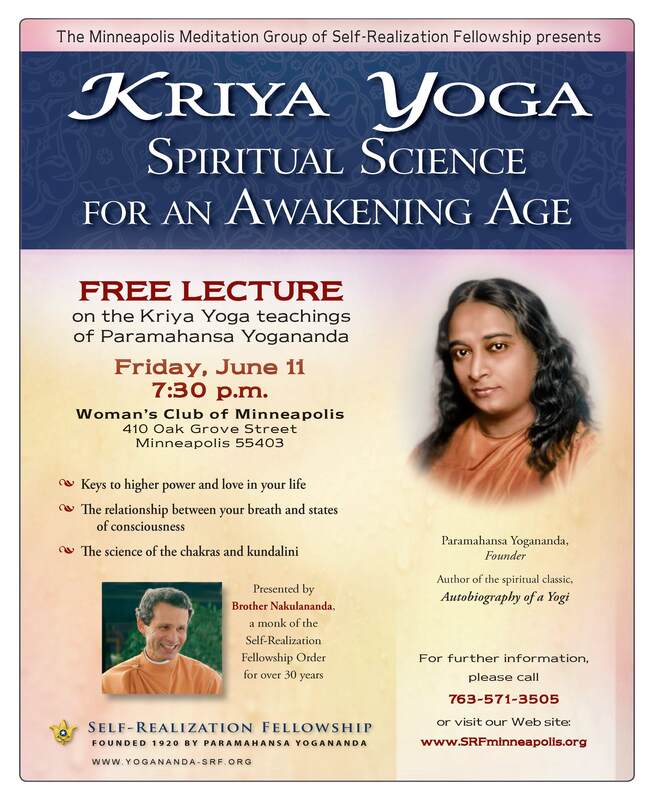 Mrs. Simon Kruse, owner of the downtown Minneapolis Radisson Hotel, separately played host to this renowned pioneer of meditation and yoga in America. Attendees inspired by his lectures and teachings on meditation formed the Minneapolis Meditation Group of Self-Realization Fellowship. 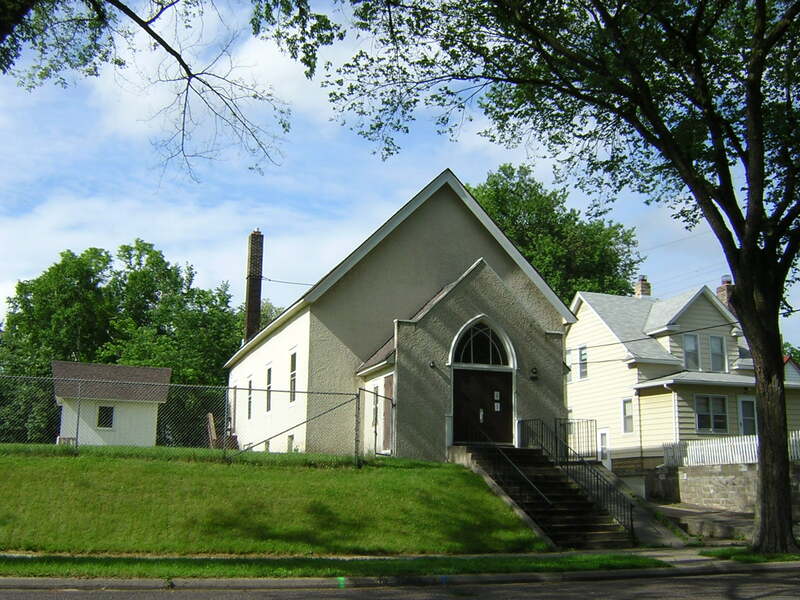 Today, eighty-five years later, the Minneapolis Meditation Group of SRF conducts meditation and inspirational services at its center in south Minneapolis, where members from the Twin Cities region come together each week for meditation and fellowship. 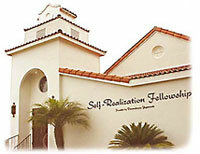 Today, Self-Realization Fellowship has more than 500 temples, retreats, and meditation centers in nearly 60 countries. SRF members have included composer George Liebling, opera star Amelita Galli-Curci, actor Dennis Weaver and botanist Luther Burbank. Yogananda’s remarkable life journey, detailed in his book Autobiography of a Yogi, remains a best-selling spiritual classic and is a curriculum staple in many colleges and universities. In 1999, it was selected by a panel commissioned by publisher Harper Collins San Francisco as one of the 100 most influential spiritual books of the 20th century. And here is a brief biography of Paramahansa Yogananda, courtesy of Self-Realization Fellowship headquarters in Los Angeles. Paramahansa Yogananda, author of the modern spiritual classic AUTOBIOGRAPHY OF A YOGI and widely revered as one of the preeminent spiritual figures of our time, contributed in far-reaching ways to a greater awareness and appreciation in the West of the spiritual wisdom of the East. Regarded as the father of Yoga in the West, Yogananda made an indelible impression on the spiritual landscape of the United States and the world. 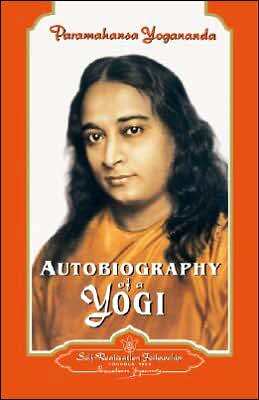 AUTOBIOGRAPHY OF A YOGI, Yogananda’s life story, was published in 1946 and expanded by him in subsequent editions. Recognized from the beginning as a landmark work in its field, the book has been in print continuously since its initial publication more than sixty years ago. Honored as one of the 100 best spiritual books of the 20th century, it remains one of the most important, and most readable, works on Yoga and Eastern spiritual thought. 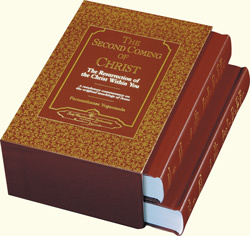 His long-awaited interpretation of the four Gospels – THE SECOND COMING OF CHRIST – which was released in September 2004, is a profoundly enriching journey into the deeper meaning of Jesus’ universal teachings. Among Yogananda’s other writings are acclaimed interpretations of the Bhagavad Gita (GOD TALKS WITH ARJUNA) and the Rubaiyat of Omar Khayyam (WINE OF THE MYSTIC: A Spiritual Interpretation), a three-volume anthology series (Collected Talks and Essays on Realizing God in Daily Life), two collections of poetry and prayer, and numerous volumes of spiritual counsel. Paramahansa Yogananda’s arrival in America from India in 1920, when he was invited to serve as a delegate to the International Congress of Religious Liberals convening in Boston, marked the beginning of an upsurge in the West of interest in the spiritual wisdom of the East. That same year he founded Self-Realization Fellowship to disseminate worldwide his teachings on India’s ancient philosophy of Yoga and its time-honored science of meditation. In 1925, he took up residence in Los Angeles where he established an international headquarters for his society. Over the next decade he traveled and lectured extensively, speaking to capacity audiences in major cities throughout North America and Europe. To the tens of thousands of Westerners who attended his lectures, his discourses on the unity of “the original teachings of Jesus Christ and the original Yoga taught by Bhagavan Krishna” were a revelation. 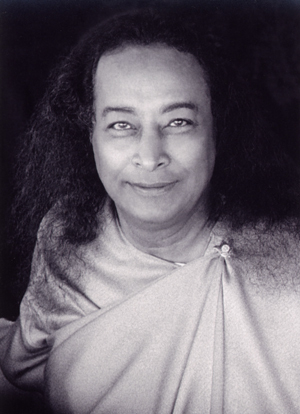 During his 32 years of public ministry in America and abroad, Yogananda devoted himself to fostering greater harmony and cooperation among all religions, races, and nationalities; and to helping people realize and express more fully in their lives the beauty, nobility, and divinity of the human spirit. He brought a knowledge of Yoga and meditation to millions of men and women, not only through his public lectures and classes, but also through his writings and the centers he established in countries around the world. Many prominent figures in science, business, and the arts became his students, including horticulturist Luther Burbank, operatic soprano Amelita Galli-Curci, George Eastman (inventor of the Kodak camera), poet Edwin Markham, and symphony conductor Leopold Stokowski. In 1927, Yogananda was officially received at the White House by President Calvin Coolidge, who had become interested in the newspaper accounts of his activities. Gandhi and Yogananda met a decade afterwards when the latter made a return visit to India in 1935–36, after first touring parts of Europe and the Middle East. 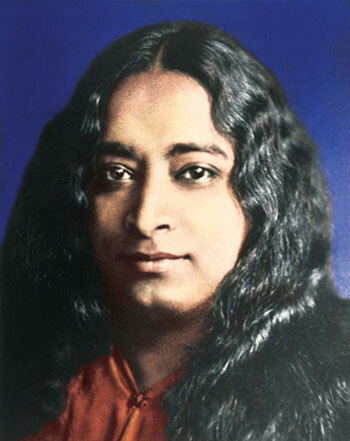 At the Mahatma’s request, Yogananda instructed him and several of his followers in the spiritual science of Kriya Yoga. 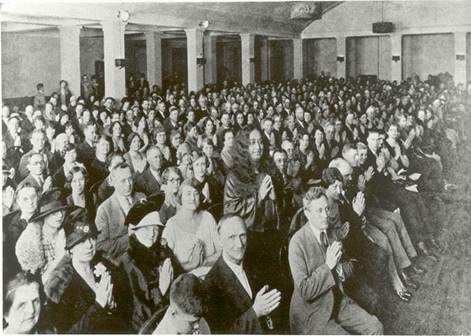 During the 1930s, Yogananda began to withdraw somewhat from extensive public lecturing in order to devote himself more to his writings, to establishing Self-Realization Fellowship temples and meditation centers, and to building a firm foundation for the future of his spiritual and humanitarian work. Under his directtion, the personal guidance and instruction that he had given to students of his classes was arranged into a comprehensive series of lessons for home study. Paramahansa Yogananda passed away on March 7, 1952, in Los Angeles, following his delivery of a speech at a banquet honoring Dr. Binay R. Sen, India’s Ambassador to the U.S. His passing received widespread coverage in the press, including in The New York Times, the Los Angeles Times, and Time magazine. 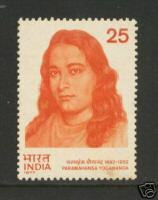 In 1977, on the occasion of the 25th anniversary of Yogananda’s passing, the Government of India formally recognized his outstanding contributions to the spiritual upliftment of humanity, by issuing a commemorative stamp in his honor. This entry was posted on March 23, 2009 at 12:02 AM and is filed under See INDEX categories above. You can follow any responses to this entry through the RSS 2.0 feed. You can leave a response, or trackback from your own site. Thanks for sharing this sweet space of a great Master – Paramahansa Yogananda! It is my great pleasure, Axel. Thank you! I really enjoy reading your blog!!! Very informative and inciteful. Excellent!!! I have added you to my google newsreader and my favourites Folder! Thanks so much, Paul! Welcome aboard! Phil, I heard the ‘Mini-apple’ word in your intro. We’re way up north near Copper Harbor, MI…you know, the place where it never stops snowing. I’ve been reading about Master’s lectures in the US and synchronistically came to your blog and it was a lovely discovery and gift for the new year. May we all be One………. Glad you found this post, Keweenaw North! May your new year be filled with Master’s blessings! Thank you, Pankaj. You are blessed to live in India. Yes, Tejaswini. That’s why I moved to Encinitas. Thank you for your beautiful homage to Yogananda. His “The Second Coming of Christ” work took all of the fear from my bible-based upbringing and brought me into a sacred and accurate understanding of Christ. I adore Master and his work! You’re very welcome, Sherry. “The Second Coming of Christ” is a must-read for anyone who . . . well . . . for anyone at all!